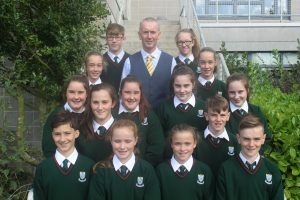 On Tuesday 29th August Cashel CS welcomed the 2017/18 First Year Group and amongst the freshmen were seven sets of twins, five of whom are identical. This is most definitely a first for the school. In their midst are four pairs of girls and one of boys. The fourteen students represent 9.8% of the first year group. Starting secondary school is a major transition in a young person’s life and we are delighted that in addition to the support structures in the school these students will share the experience with each other. We look forward to seeing all of the first years thrive as they grow towards adulthood. In the meantime the next six years will doubtless produce many unique photo opportunities.